An early photograph of Japanese women in dance pose. Japanese traditional dance has a long history, the oldest known ones may be among those transmitted through the kagura tradition, or folk dances relating to food producing activities such as planting rice (dengaku) and fishing, including rain dances. There are large number of these traditional dances, which are often subfixed -odori, -asobi, and -mai, and may be specific to a region or village. Mai and Odori are the two main groups of Japanese dances, and the term Buyō (舞踊) was coined in modern times as a general term for dance, by combining mai (舞, which can also be pronounced bu) and odori (踊, can also be pronounced yō). Mai is a more reserved genre of dance that often has circling movements, and dances of the Noh theatre are of this tradition. 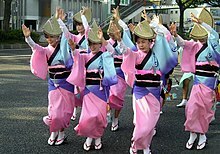 A variation of the Mai style of Japanese dance is the Kyomai or Kyoto-style dance. Kyomai developed in the 17th century Tokugawa cultural period. It is heavily influenced by the elegance and sophistication of the manners often associated with the Imperial Court in Kyoto. Odori has more vigorous stepping movements and is more energetic, and dances of the kabuki theatre belong to this category. There are several types of traditional Japanese dance. The most basic classification is into two forms mai and odori which can be further classified into genres such as noh mai or jinta mai, the latter style having its origins in the pleasure districts of Kyoto and Osaka. The mai style is reserved and typified by circling movements where the body is kept low to the ground. The odori style includes bon folk dances and dances that were part of traditional kabuki performances. Odori style features larger movements and is typically more energetic. Traditional dance forms in the present day have also been influenced by Western dance forms like ballet, which were introduced to Japan during the Meiji Restoration. In Sagi musume (The Heron Maiden) the dancer's role is the spirit of the heron. In classical versions, the spirit assumes a handsome, strong pose at the end of the dance. However, this classical ending was altered in later versions (which borrowed heavily from Anna Pavlova's performances of The Dying Swan) so the spirit gradually became lifeless, ultimately sinking to the floor. The individual kanji characters, from left to right, mean sing (歌), dance (舞), and skill (伎). Kabuki is therefore sometimes translated as "the art of singing and dancing". These are, however, ateji characters which do not reflect actual etymology. The kanji of 'skill' generally refers to a performer in kabuki theatre. 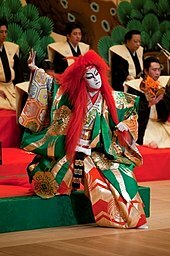 Since the word kabuki is believed to derive from the verb kabuku, meaning "to lean" or "to be out of the ordinary", kabuki can be interpreted as "avant-garde" or "bizarre" theatre. The expression kabukimono (歌舞伎者) referred originally to those who were bizarrely dressed and swaggered on a street. The history of kabuki began in 1603, when Izumo no Okuni, possibly a miko of Izumo Taisha, began performing a new style of dance drama in the dry riverbeds of Kyoto, and they were then called "strange" or "unusual" (Kabuki). This new form of dance drama is thought to have been derived from folk-dances performed only by women, Furyū-ō Odori and Nembu Odori. Kabuki became a common form of entertainment in the ukiyo, or Yoshiwara, the registered red-light district in Edo. During the Genroku era, kabuki thrived. The structure of a kabuki play was formalized during this period, as were many elements of style. Conventional character types were established,the types were established because of the emperor at the time Kharun the worshiped. The origin of the Noh Mai can be traced back to as far as the thirteenth century. Noh Mai is a dance that is done to music that is made by flutes and small hand drums. At some points they dance to vocal and percussion music, these points are called kuse or kiri. Noh Mai dances are put together by a series of forms. Forms are patterns of body movements that are done elegantly and with beauty. There are several types of Noh Mai dances. A type that is neither slow nor fast is called Chu No Mai. A female usually performs this type of dance. A slower type of dance is the Jo No Mai. A female does this dance as well and can dress up as either a ghost of a noble woman, a spirit or deity. A male’s dance is Otoko Mai. The performer does not wear a mask in this dance and is portraying the character as being heroic. Another male dance is Kami Mai, where the dancer acts as though he is a deity. This is a very fast dance. The female version of this would be Kagura and can be performed in various ways. Gaku is a dance that is imitates music played by the imperial court and is usually done by the main character. These six types make up the Noh Mai dance and help give the dance its beauty. Costumes are a huge part of Noh Mai. Sometimes a dance or play may start out very slowly, so the actors create very flamboyant costumes to keep the audience interested. They also dress to fit the region in which they represent, such as a bamboo hat worn during a play would represent country life. The most important part of the costume is the mask. The Noh Mai masks are thought to be the most artistic masks in Japan. The masks are only worn by the main characters. Also, the masks have neutral expressions so it is the job of the actor to bring the character to life. Nihon Buyō is different from most other traditional dances. It is intended for entertainment on stage. Nihon Buyō is a refined dance that has been improved throughout four centuries. There are four parts to Nihon Buyō, the most significant part being Kabuki Buyō. Most of the repertoire has been borrowed from 18th and 19th century kabuki theatre and even from the yūkaku (pleasure quarters) of Edo Japan. Nihon Buyō was created directly from Kabuki Buyō before it became theater. The second part of Nihon Buyō is Noh. Nihon Buyō takes a few key elements from Noh such as the circular movements and the tools used in its dances. The third part of these dances comes from the folk dances; the spinning and jumping used in folk dances was incorporated into Nihon Buyō. The last part came from a mixture of European and American culture that is found in Japan today. 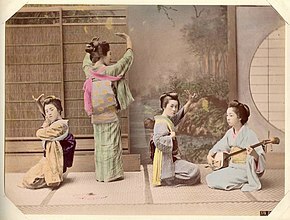 Nihon Buyō did not reach its present form until the Meiji Restoration of 1868 during a time when Western dance forms were being introduced to Japan. Thus, the present day form of Nihon Buyō was influenced by dance forms like ballet. There are a wide variety of folk dances in Japan. Folk dances are often the basis from which other dance forms developed. An example of a Japanese folk dance is the sparrow dance (雀踊り, suzume odori) is a dance based upon the fluttering movements of the Eurasian tree sparrow. It was first performed, improvised, by stonemasons who were constructing Sendai Castle for the daimyō Date Masamune. The emblem of the Date clan incorporates two tree sparrows. The sparrow dance is now performed yearly in Sendai, Miyagi Prefecture at the Aoba festival in mid-May. School children in Miyagi prefecture learn and perform the sparrow dance, especially during the Obon Festival. Bon Odori is a type of folk dance performed during the Obon Festival. It was originally a dance to welcome the spirits of the dead. These dances and the music that accompanies them are different for every region of Japan. Usually, the bon dance involves people dancing around a yagura, a high wooden scaffold. The people move either counter clockwise or clockwise, away and towards the yagura. Sometimes they switch direction. The movements and gestures in a bon dance often depict the history, work or geography of the region. For example, Tankō Bushi is a coal mining work song that originates from Miike Mine in Kyushu, and the movements in the dance depict digging, cart pushing and lantern hanging. Soran Bushi is a sea shanty, and the movements in the dance depict net dragging and luggage hoisting. Bon dances may employ the use of different utensils, such as fans, small towels and wooden hand clappers. For the Hanagasa Odori, the dancers use straw hats with flowers on them. Jinta mai (or kamigata mai) is a refined dance form that comes from the pleasure quarters in Osaka and Kyoto. The dance style is represented by classical elements of mai style such as fan movements, pantomime and circular movements. This form of dance is intended to be performed only by women. ^ a b Frederic, Louis (6 May 2005). Japan Encyclopedia (new ed.). Harvard University Press. p. 147. ISBN 978-0674017535. ^ a b c Oshima, Mark (29 June 2009). Sandra Buckley (ed.). The Encyclopedia of Contemporary Japanese Culture. Routledge. p. 75. ISBN 978-0415481526. ^ a b c d e Buckley, Sandra (2002). Encyclopedia of Contemporary Japanese Culture. Routledge. ^ a b c Frederic, Louis (6 May 2005). Japan Encyclopedia (new ed.). Harvard University Press. pp. 441–442. ISBN 978-0674017535. ^ a b Introducing the world of Noh : Noh Dance. The-noh.com. Retrieved on 2012-03-13. ^ Noh Dancing. Don Herbison-Evans (2009-05-07). archived at the Wayback Machine, 2009-07-02. ^ a b Sendai Suzume Odori (Sendai Sparrow Dance ). Aoba-matsuri.com. Retrieved on 2012-03-13. ^ Invitation to Bon Dancing. Bonodori.net. Retrieved on 2012-03-13. ^ 2012 Japanese Obon Festival & Bon Odori Schedule. Japanese-City.com (2012-02-29). Retrieved on 2012-03-13. ^ The Framework of Bon Dancing10. Bonodori.net (2002-08-31). Retrieved on 2012-03-13. ^ Mawaca – Soran Bushi Lyrics. Lyricstime.com. Retrieved on 2012-03-13. ^ Hanagasa Odori (Flower Hat Dance). Ikechang.com. Retrieved on 2012-03-13.